The historic bell tower still looms tall within the front gate of the Glendale Cemetery. 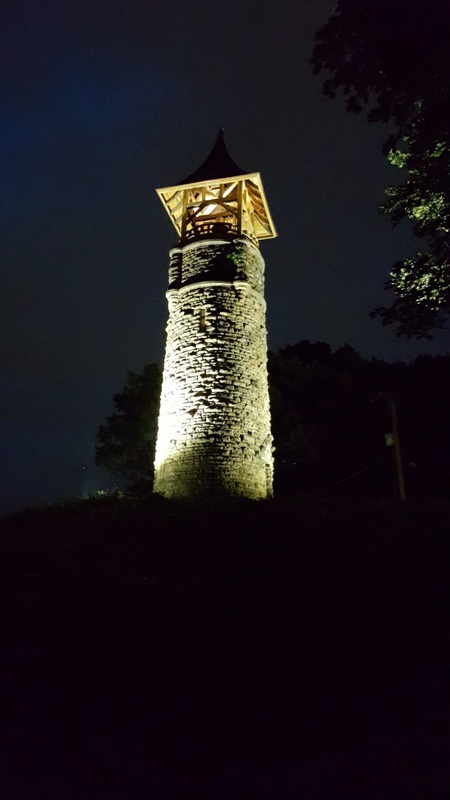 Construction began in 1883 on the 64-foot bell tower at the top of Ordnance knoll. Meant to compliment the Civil War Memorial Chapel at the base of the knoll. Like the chapel the bell tower was designed by Akron architect Frank O. Weary. The lower section was started in August by builder Alfred Barns of Peninsula stone in a rustic finish 40-feet in height. This was topped by an 8-hoot rustic timber frame work and crowned with a 14-foot splayed roof giving a total height of 64-feet to the finished tower. By November the 700-pound bell was lifted into position with no elaborate ceremony to mark the occasion. 134 years later ARRC, Inc is managing the restoration of the roof, roof support and bell along with the platform at the top of the tower. Project was completed in September of 1027.